Relics from the hard-fought defence of Rorke’s Drift in the Zulu War are among the lots for sale in a Kent auction as part of an extensive collection from the period. A South Pacific ula throwing club and a Maori canoe bailer that once belonged to an English reverend killed by cannibals in Vanuatu in the 19th century has sold at an auction at Duke's Auctioneers in Dorchester. An African headrest soared past its upper estimate to take £65,000 at a recent Edinburgh auction. A collection of Maori artefacts with an unbroken provenance dating back to their acquisition by early English missionaries to New Zealand will be offered for sale at John Nicholson’s of Fernhurst on October 5. There was some good old-fashioned auction drama at the Elgin Auction Centre in Morayshire on August 23 when two lots of loosely-catalogued tribal clubs sold to online bidders for a combined £46,500. The tribal art auction to be held at Drouot by Binoche et Giquello on June 22 features a mix of African and Oceanic artefacts and will include two lots that formerly belonged to the artist Tristran Tzara. Estimated at £50-100, this Maori flute sold for £140,000 (plus 24% buyer’s premium) at John Nicholson’s of Haslemere on February 23. Some good old-fashioned saleroom drama ensued at Ewbank’s of Send in Surrey on December 1 when a tribal art necklace estimated at £60-100 sold to a buyer from Continental Europe at £99,000 (plus 22.5% premium). Pablo Picasso is revered as a key pioneer of Cubism, the radical approach to representing reality that he spearheaded with Georges Braque in the early 1900s. As with so many art movements, its roots extend further back, however. South Pacific war clubs continue to strike high prices at auctions, as this Tongan example sold in Stafford this month shows. Lady Jane Franklin (1791-1875) gained worldwide admiration for her efforts to trace her husband’s disappearance on his fatal 1845 voyage seeking the North West Passage. ALL 49 lots from the Murray Frum collection of Oceanic art found a buyer on September 16 at Sotheby’s (25/20/12% buyer’s premium) in Paris. The hammer total was €6.24m (£5.2m). As the summer break ends, next month sees a rush of activity in the art world with a flurry of events not least in the Tribal Art category. 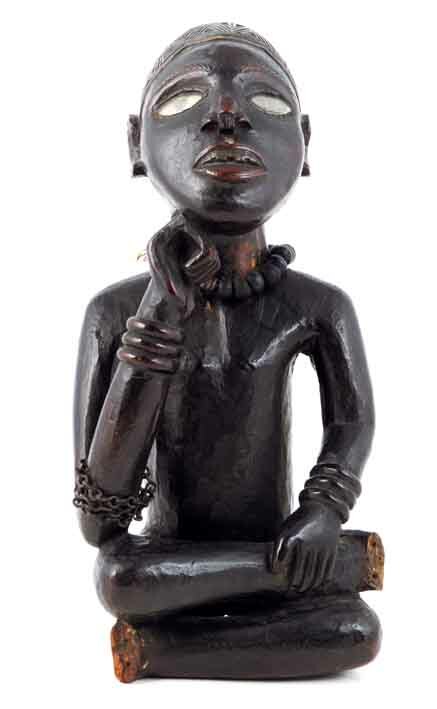 The first stand-alone tribal art sale held by Woolley & Wallis in Salisbury was topped at £44,000 by this 19th or early 20th century Yombe seated figure from the Democratic Republic of Congo.